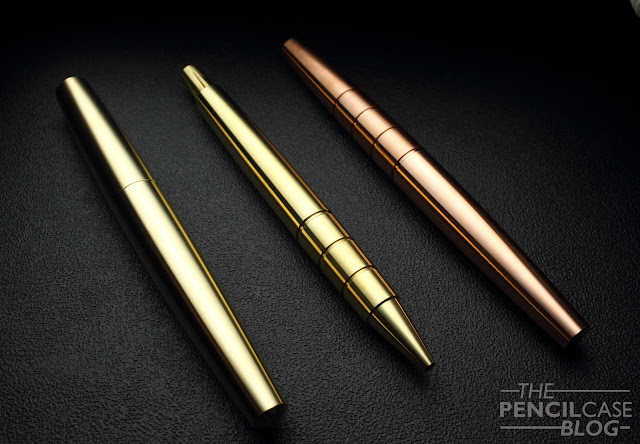 Around the same time when I reviewed the Nova fountain pen in the ebonite finish, Namisu came up with a new pen project: the X-01. 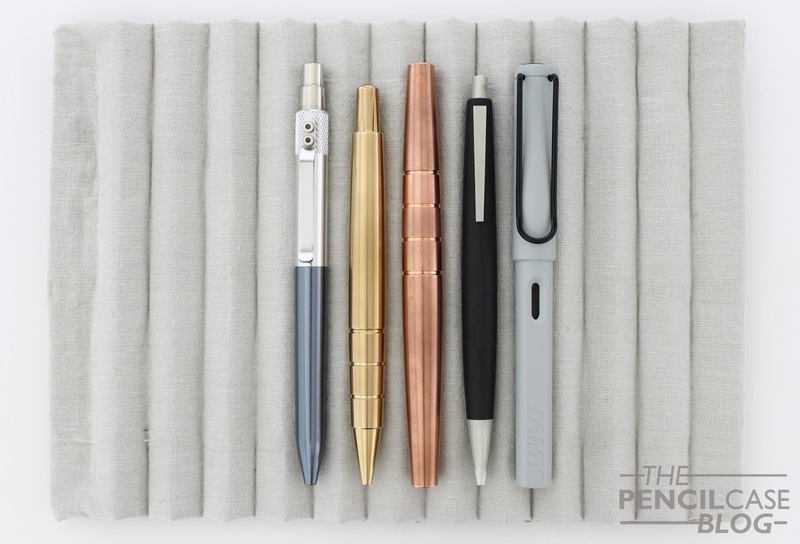 It's their fourth kickstarter already, and the second rollerball/ballpoint (The previous one being the Nova rollerball). 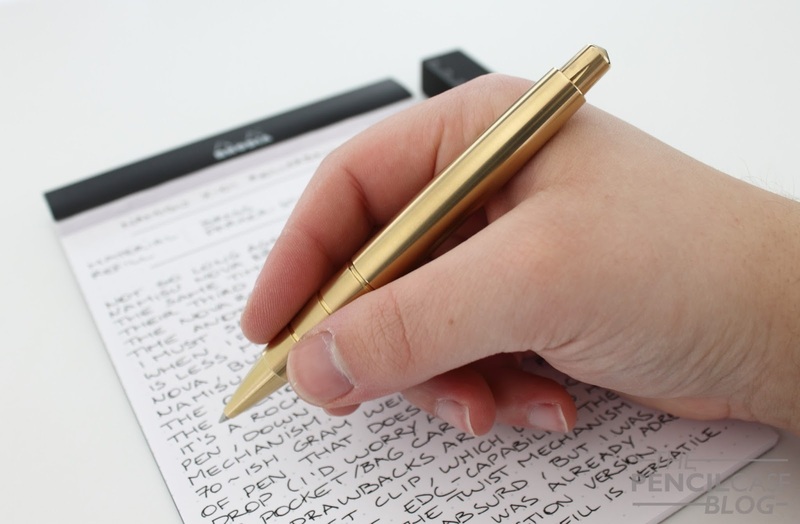 The design of the X-01 is largely inspired by the Namisu Orion, but obviously now in a ballpoint pen shape. It may have lost some of that clean design that the Orion and Nova had, but they still did a pretty great job of keeping everything simple and straightforward. If I have to be really picky on the design, there's just one small detail that I'm not a huge fan of: the machined lines on the twist knob. I think it would've looked better without the machining, and I don't feel like it adds much practical value either. The twist mechanism works so smooth and effortless that you don't need the extra grip these lines provide. I was sent a prototype version of the brass X-01. Apart from brass, you can also choose for aluminium or Titanium. I like brass, it's a neat material that feels hefty and solid, and it gets some really neat patina after a while. It also makes your hands smell like pennies, which is something I personally quite like, although it could also be a downside for some people. The brass version is the heaviest of the three, and weighs in at a little over 70 grams. That's some serious heffor a pen, and I'm pretty sure a lot of people would probably find it too heavy. I personally like heavier pens, but even I sometimes found it fatiguing to write with for longer periods. In their kickstarter campaign, they recommend the brass version for short notes or signatures, whereas the other versions are more suited for longer writing sessions. If you want to play safe, the lighter aluminium (27g) and titanium (41g) versions are definitely the better choice. The brass version has some unique properties, but it's either hit or miss depending on your personal taste. Measuring in at 13.2cm (5.2in), the X-01 hits a sweet spot of being compact enough for pocket carry, yet remains long enough to be held comfortably. The machined ridges around the section make for a very tactile experience, and provide decent grip to an otherwise slick pen. The ridges are quite deep which makes them noticeable in the hand, but the edges are bevelled so they don't dig into your fingers as much as I initially feared they would. 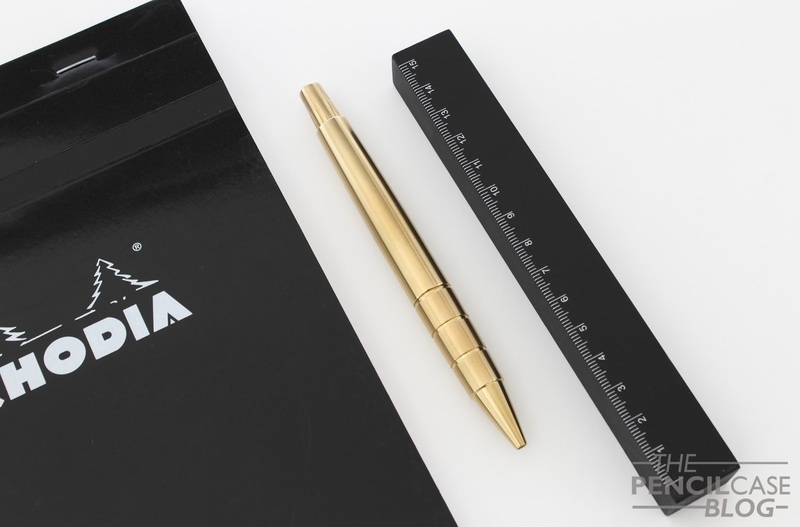 The X-01 has the potential of being a great pocket-carry, EDC pen. However, in true Namisu style, you'll have to do without a pocket clip. While that means it won't interfere with how you hold your pen, it also limits the ways you can carry it with you. Other than that it's a pen that's made to be used. The parts are all solid metal, and everything fits together perfectly. 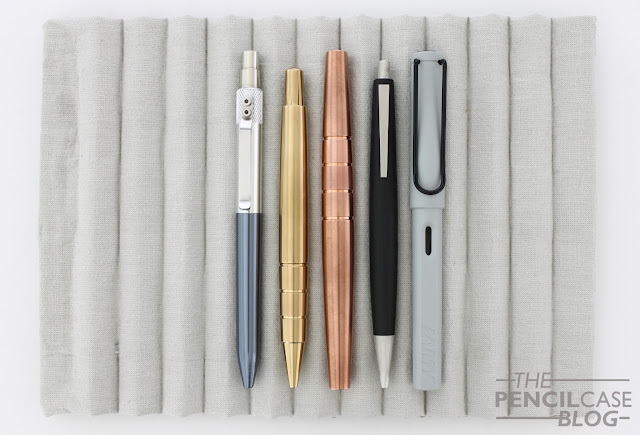 Just by looking at it, and holding it in your hand, you can feel that this is the kind of pen that can handle years of intense use without breaking a sweat. 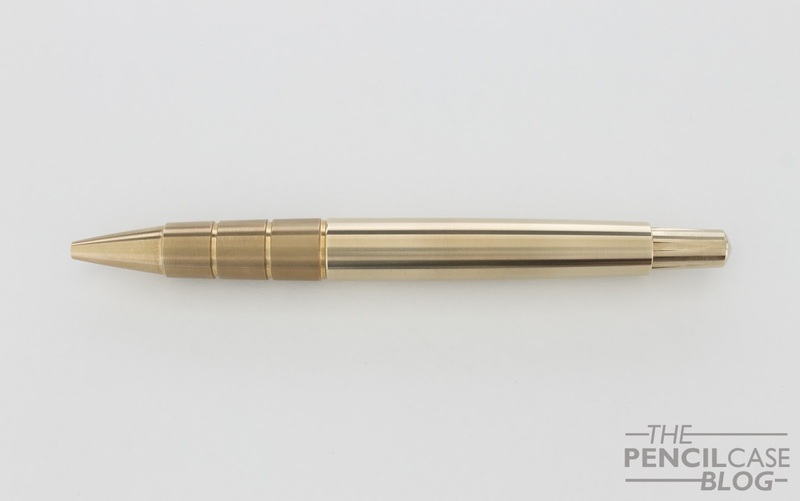 The twist action mechanism is custom machined for this pen, and the knob and mechanism are all just one piece which is quite a neat bit of engineering. One remark is that the mechanism has a ridiculous amount of travel to fully retract or extend the refill (two and a half turns! ), but the people from Namisu pointed out that this will be improved in the final production version. 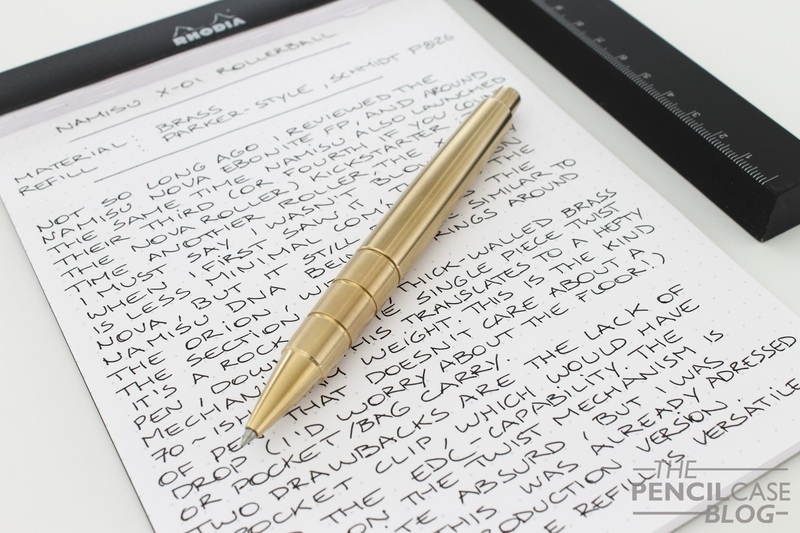 As for the refill, the X-01 comes standard with a Schmidt P8126 rollerball ready to go. Schmidt refills are definitely a good way to go, so no complaints there. An added benefit is that normal parker-style refills also fit, so you have quite a wide variety of options to go with. It's no secret that I'm a fan of minimal design, so the X-01 is off to a good start there (at least in my book), but it also turned out to be quite a functional pen that I reached for more often than I thought I would. 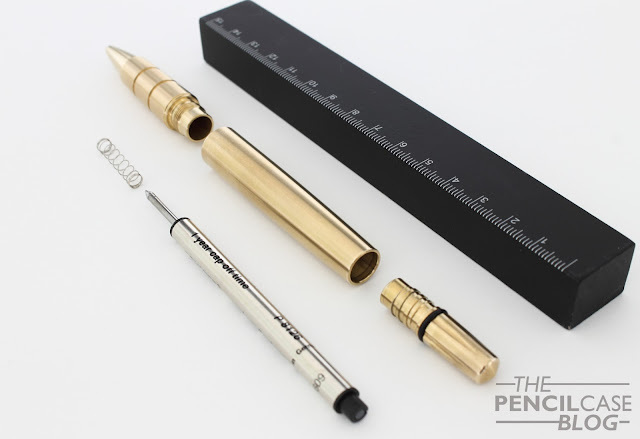 It's a cool, rock-solid pen, that I think would definitely be suited for EDC. The kickstarter campaign for the X-01 (that you can find HERE) is almost over, with just three days left on the clock. So if you're interested, there's no time to waste! Prices are very reasonable, starting at 35 GBP (44 USD) for the aluminium version, 46 GBP (58 USD) for the brass, and 69 GBP (86 USD) for the titanium version. Of course those will go up a bit after the Kickstarter, but their pricing is generally very sharp (especially considering the quality you get) so I expect that the price for the X-01 will remain competitive in the future as well. Note: This product was sent to me by Namisu, free of charge, so I could write this review. I was in no way influenced in the making of this review, the opinions shared in this review are completely my own! This post does not contain affilate links. Yes it's indeed good that they also fit this more general style of refill, the Schmidt rollerball refills are excellent but it's nice to be able to have some variety!